3D Renderings are a very effective way of showing new capital improvements in great detail, one room at a time, but what about when a leasing agent wants to demonstrate a whole floor to a perspective tenant? Highly detailed 3D floor plans are a great way of showing the layout of a space and it’s potential. Incorporating furniture choices, material finishes, and interior design selections helps stimulate an emotional response to the space and is a much more effective leasing tool than flat 2D Floor Plans. We recently delivered a 3D Floor Plan of a section of a new building in Memphis Tenessee. The goal of the project was test the architects design concepts while simultaneously create a marketing tool to attract new tenants. The client was very happy with the end product which were used to created display boards for the lobby and will also be included in print materials passed out to local commercial brokers. 3D Floor Plans can also be used in the retail real estate industry as well. They can show a full site plan, showcasing specific stores, anchor tennants and other common spaces in great detail. Our clients have reacted very positively to this technology as it’s success is easily measured by an increase in deal closings. Thanks to a technology breakthough by German Start-Up SeeReal Technologies we might be in for a revolution in the level of realism that can be achieved when creating a 3D Walkthrough of a property. An article we found in todays Personal Computer World’s online magazine describes the technology in a little more technical detail. 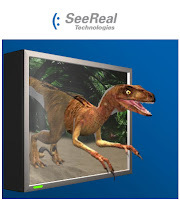 The technology could be ready by the year 2009 if SeeReal is able to attract the right partners. You are currently browsing the archives for the 2D Floor Plans category.